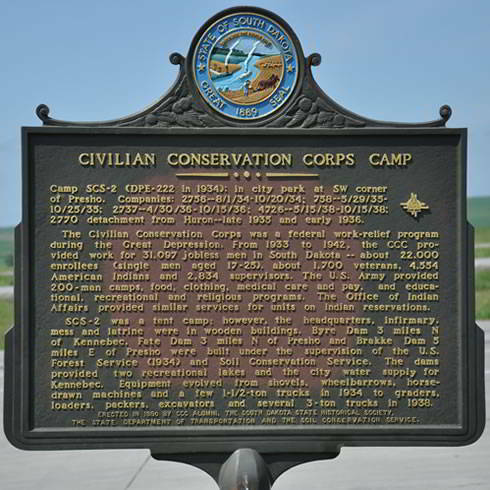 SCS-2 was a tent camp; however, the headquarters, infirmary, mess and latrine were in wooden buildings. Byre Dam 3 miles N of Kennebec, Fate Dam 3 miles N of Presho and Brakke Dam 5 miles E of Presho were built under the supervision of the U.S. Forest Service (1934) and Soil Conservation Service. The dams provided two recreational lakes and the city water supply for Kennebec. Equipment evolved from shovels, wheelbarrows, horse-drawn machines and a few 1-1/2-ton trucks in 1934 to graders, loaders, packers, excavators and several 3-ton trucks in 1938. Notes: Equipment evolved from shovels, wheelbarrows, horse-drawn machines and a few 1-1/2-ton trucks in 1934 to graders, loaders, packers, excavators and several 3-ton trucks in 1938.